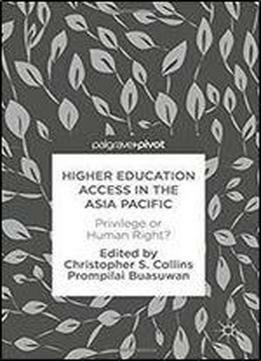 Higher Education Access In The Asia Pacific: Privilege Or Human Right? This edited volume offers empirical, evaluative, and philosophical perspectives on the question of higher education as a human right in the Asia Pacific. Throughout the region, higher education has grown rapidly in a variety of ways. Price, accessibility, mobility, and government funding are all key areas of interest, which likely shape the degree to which higher education may be viewed as a human right. Although enrollments continue to grow in many higher education systems, protests related to fees and other equity issues continue to grow. This volume will include scholarly perspectives from around the region for a more extensive understanding of higher education as a human right in the Asia Pacific.